Bassoonist Dr. Jacqueline Wilson, Assistant Professor of Double Reeds. In addition to being an accomplished musician, Wilson is someone who puts an emphasis on building a lasting and strong relationship with her music students. Her journey in music began in Kennewick, Washington when she started playing in her high school’s band in as many students do. Her mentorship with that band director along with others throughout her education is what led her to do the same for other music students. She also said she felt attracted to the idea of helping students through what can be a difficult transition in their lives. Beside just being a music professor, Wilson has written several educational articles that have been published. 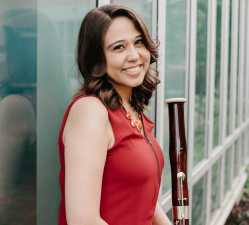 She has also been invited a few times to play at the International Double Reed Society Conference and has been invited back to play again this summer at the University of South Florida in Tampa where the conference will be held. “Anytime that your peer group says, ‘Yes we want that person to participate,’ is a big deal,” Wilson said. Her proudest accomplishment yet is being on the competition committee for the Meg Quigley Vivaldi Bassoon Competition and Symposium, a competition only for women of the Americas. This year the competition was held at the Colburn School in Los Angeles, California. 2019 was the first year for Wilson to be on the committee along with three others. “The whole idea behind it is creating opportunities for women in classical music — which has typically been a male-dominated field — and having this environment of empowerment,” Wilson said. Wilson also includes her Native American heritage into her music. She performs a lot of works by Native American composers, which is the theme of her upcoming recital.